The politicizing of our national monuments is well underway, with the National Park Service (NPS) pushing the president's pro-illegal immigrant agenda in a new exhibit at the Ellis Island Museum. The Obama administration and Democrats (helped by more than a few Republicans) have been attempting to normalize illegal immigration for some time, so it is not surprising that they would enlist the NPS, a federal bureau in the Department of the Interior, to rewrite history to turn U.S. law enforcement into the bad guys. Ellis Island, the legal entry point to America for millions of immigrants from 1892 until 1954, now welcomes well over four million tourists every year. The museum has the opportunity to influence a vast number of unsuspecting people. At the museum, park rangers and exhibits educate those visiting this federally owned monument operated by the NPS on the country's immigration history. But judging by an account in the New York Times, the museum has become a tool of the administration’s agenda to glorify illegal immigration. In a newly opened exhibit covering immigration in the post-1954 period, the museum depicts the experience of those who attempt to enter this country illegally. However, the exhibit paints the illegal aliens as the heroes of this new immigration saga, individuals only seeking work and to be reunited with family. The new exhibit also portrays Border Patrol agents and the Park Service's own rangers, whose job it is to defend the integrity of the U.S. borders, as the bad guys who, by securing the parts of the border that were routinely breached, force these individuals into "remote and dangerous terrain". This fortification [of the border] has pushed men, women, and even children, who seek to cross on foot without documentation, even deeper into remote and dangerous terrain. They cross deserts and mountain ranges on foot and swim contaminated irrigation ditches. They crawl through sewer pipes and tunnels. To find work and reunite with family members, hundreds risk their lives every week to reach the United States. Bob Eggle, the father of Kris Eggle, a National Park Service ranger killed by an illegal alien who entered this country on foot via the southern border, had this to say: "I am aghast at the new exhibit's ignorance of the terrorist threat and insensitivity to the hard work and safety risks faced by those representing the National Park Service. Those wishing to reunite with family are just a subset of the many who are crossing our southern border." Continued Eggle: "I am also appalled that NPS bureaucrats would so obviously malign the efforts of my son, other LE [law enforcement] rangers, and Border Patrol agents who have been tasked to protect and control our borders. My son valiantly strived to do this up to the day of his ambushed murder by an illegal who came across our border." If the border were actually "militarized", certainly there would not be a vast illegal population in the country. 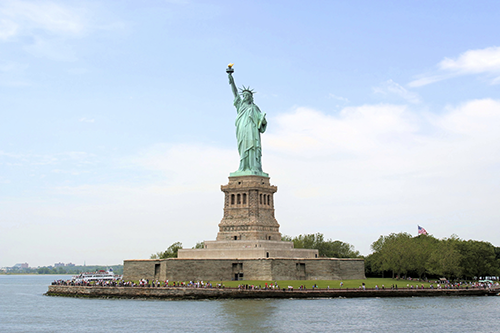 Just as immigrants who entered through Ellis Island were required to undergo medical and legal examinations and baggage inspection, legal immigrants today (about 1 million are admitted each year) are processed to ensure the public's medical and physical safety. Legislators serving on the U.S. House Natural Resources Committees and the U.S. Senate Committee on Energy and Natural Resources, who have oversight and legislative responsibilities for the NPS, should call for the new exhibit's language and focus to be changed. A national museum should not be working to demonize our democratically enacted laws, nor its own agency brethren who, together with other federal agents, risk their lives to uphold them.